Do you enjoy learning and also have a passion for Shlichus? Kollel Menachem is currently looking for Yungeleit who are serious about learning and also have an interest and passion in Shlichus and teaching Torah and Chassidus, to join our team and make a real difference and impact on the Melbourne Anash and wider Jewish community. Kollel Menachem is a unique Kollel, a place where you will gain and give. Grow in your own learning and Shlichus skills and be involved in the Rebbe's Shlichus. Why Should I Choose Kollel Menachem? Warm atmosphere among the Kollel Yungeleit and with the hanholo. And a welcoming Anash community. 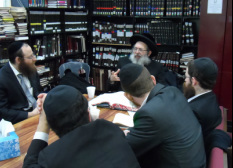 Kollel Menachem offers a formal structured program for your learning. Yungeleit will be able to master key areas of halocha b'iyun. The learning program follows a schedule and curriculum with clear goals and objectives. The possibility of learning your personal areas of interest are also possible during part of the Seder. Sugyos which are studied include; Hilchos Shabbos, Niddah and Mikvaos. Weekly Shiurim on the sugya with a focus on halocha leMaaseh are given by the Rosh HaKollel as well as guest Rabbonim. The Shiurim and learning is accompanied by hands on Shimmush in the practical application of the halachos being studied. 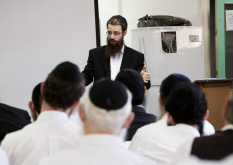 Kollel Yungeleit are Shluchei Torah: A large focus of the Kollel is our Adult Education activities. Our Yunegeleit make a huge impact on the community, learning in Chavrusa with local Yungeleit, balabatim and students. Real life-long friendships and relationships are created and you can make a deep impact on people's lives. Kollel Yungeleit are encouraged to give regular Shiurim as part of our Adult Education program, including lectures at our annual Summer and Winter Yarchei Kallah programs. Assistance and direction in organising, preparing and presenting shiurim is provided. This provides an excellent opportunity to develop your skills in giving shiurim which will further assist in preparing for and finding your future Shlichus. In addition to our learning program, Kollel Menachem also provides Shlichus training opportunities, to provide you with the skills which will assist you in your future Shlichus. We bring in guest Shluchim and professionals who present on a variety of topics including; fundraising, public speaking, writing, counselling, chinuch, Shlichus skills and preparing shiurim. Guest Rabbonim address practical aspects of Rabbonus and Beis Din, including; gittin, giyur and answering shaalos. Melbourne is home to one of the largest Anash communities outside of Eretz Yisroel and North America. The community is renowned for its warmth and welcoming nature, especially to our Kollel families. The community is one which appreciates Torah and those devoted to its study. The community has schools, yeshivos and moisdos and botei Chabad. The Kollel is situated in the heart of the community. The Kollel in turn services the community by providing shiurim, Chavrusas and other learning opportunities. Kollel Menachem looks after our Yungeleit with a generous Kollel stipend so that our you can focus on your learning and teaching. Please contact us to find out more. The Kollel Beis Medrash is a comfortable place for your learning. We have a comprehensive library of seforim and a computer research station with the Otzar HaChochma program. The Beis Medrash is adjacent to the Yeshivah Shul and is used as the community Beis Medrash. At Kollel Menachem, our Kollel wives are partners in Shlichus with their husbands. Under the auspices of the Kollel, Chana's Circle runs social and other events for the young married women in our community. Teaching positions are often available to Kollel wives within the local Moisdos (subject to availability and visa requirements). The Kollel also regular arranges social programs for the Kollel wives, and presentations on practical Shlichus topics, family and relationships. Kollel Menachem Lubavitch was established in 5739 by head-Shaliach Rabbi Y.D. Groner ז“ל at the specific direction of the Lubavitcher Rebbe. As the first Kollel in Melbourne, Kollel Menachem has and continues to have an immense impact on the community. The Kollel is part of the Yeshivah Centre, Chabad Institutions of Australia. First and foremost, the Kollel is a Beis Medrash where Yungeleit can advance their learning after marriage. The Kollel provides a structured learning program with a focus on in-depth learning of Halocha. In addition, the Kollel serves as a vibrant centre of Adult Education providing Shiurei Torah within the Melbourne Anash and wider Jewish Community. Alumni of Kollel Menachem serve as Rabbonim, Mechanchim and Shluchim throughout the world. To read their testimonials click here.